There are now other pages re the Devonian, found here: 66, 67, 68 & 69. I will place on this page such data as can be found about the Devonian, a steamer that was part of the Volturno rescue fleet & indeed landed 59 Volturno survivors at the port of Liverpool in England on Oct. 14, 1913. Hopefully the page will expand as new data becomes available. If you wish to fully understand the horrors of the disaster that befell the Volturno, do not fail to read the texts below published in the Liverpool Echo of Oct. 14, 1913. It is a more human account of the events that any I have so far read elsewhere. I like to start off each rescue vessel page with a good sized quality image of the vessel in question, in this case the Devonian. And now, thanks to Tony Jones, a Volturno researcher & enthusiast from North Wales, I am able to provide an image of the Devonian taken, so Tony informs me, on Jul. 10, 1913 in the Mersey. Tony, we thank you so much. The text at left reads simply 'S.S. Devonian' and at right is the name of the photographer which I believe reads 'Priestley & Sons Ltd. Egremont 2967'. Before the above image was received, I did have the following Devonian image (below) which I derived from an e-Bay item sold in Sep. 2003 - a postcard sent from England in 1910 (franked "Liverpool� 5.45 P.M. JU 17 10", as you can see at left). The message on the card makes it clear that JU means the month of June. I learn that there was at least one other version of the card published, with someone using the 1900s equivalent of Photoshop - to remove the dock from the image, & replace it with water! Before we leave the subject of the postcard image, another copy of it sold for U.S. $17.95 on e-Bay in Feb. 2006. That particular card had recorded on its face at bottom left 'Photo by Hodge, Boston'. And a copy, said to date from 1913, & without the dock, sold for U.S. $36.60 in Jan. 2006. Can you help with additional Devonian images? If so, do please write to me. Since the above was written, many years ago now, 'Photoship', a fine site indeed, has become available on the WWW. The site features images of many many thousands of ships. Including Devonian. The image that appears above can be seen here. And additional Devonian images are available here & here. Thanks to Raymond Brown, I can tell you that on her maiden voyage, from Liverpool to Boston on Sep. 15, 1900, 'our' Devonian carried 135 1st Class passengers. And on October 3, 1900 she collided with a Norwegian ship, which was anchored in the Mersey. BOSTON, Oct. 10 Mrs. Annie Robinson of Liverpool, a survivor of the Titanic disaster, jumped from the Leyland Line steamer Devonian last night while the liner was groping through a heavy fog. Officers of the vessel, which arrived today, said that Mrs. Robinson had been in a high state of excitement because of the fog and the sounding of the fog horn. She was formerly a stewardess on the Titanic and was coming here to visit relatives. Sadly, I learn that the Devonian was indeed later sunk by torpedo ~ on Aug. 21st 1917 by German submarine U-53. With the loss of two lives. She went down 20 miles N.E. of Tory Island which is off the coast of Donegal, Ireland. 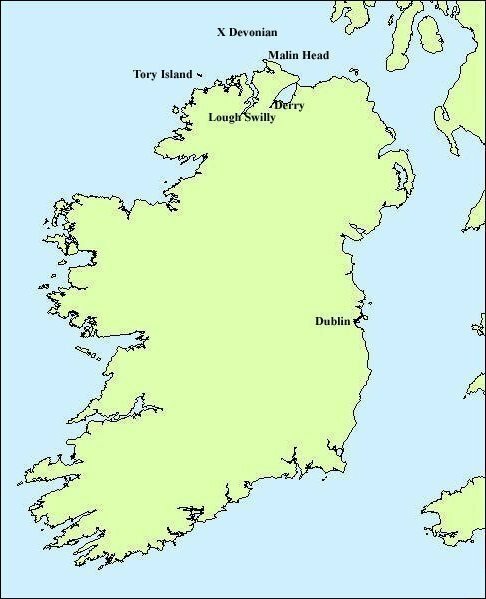 Donegal is located at the extreme north west of Ireland. Ian Lawler, a recreational diver from Ireland, has advised me of the following text, taken from the Lloyd's shipwreck index of Ireland. Thank you so very much, Ian! The reference to 'horsemen' in the text is a bit of a puzzle, to the webmaster, at least. Ian has kindly provided also, a map, available here, that has marked upon it the approximate position of where the vessel lies. 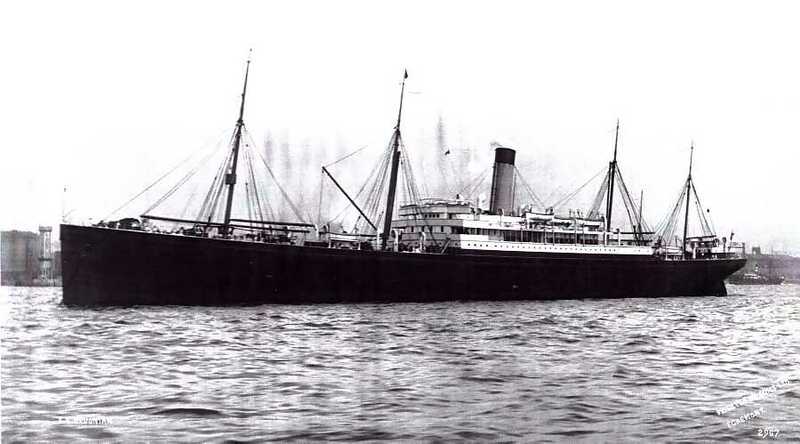 This steamship was torpedoed and sunk by the German submarine U53 with the loss of 2 crew. She was carrying 500 tons of general cargo and a large number of horsemen and was in convoy making 9 knots, when torpedoed on the port quarter in nos 6 and 7 holds at 11:55 am 21/08/17. One boat was destroyed in the explosion but the remaining eight were lowered and most of the crew got away�in them, the carpenter and his mate being killed. A tug and a trawler arrived and picked up some of the survivors who were clinging on the floating wreckage, after which the tug went alongside and took off the master and 12 men. The ship sank at 0:45 pm and the survivors taken to Lough Swilly (big inlet to W of Malin Head) and landed at Buncrana. She was on a voyage from Liverpool to Boston when sunk. I think, however, that the reference to 'horsemen' is now a little clearer. Lyndon Comstock advises that his grandfather, Lyndon M. Comstock, was aboard the Devonian in 1915 when it returned from Liverpool to Boston - as a horseman. He was, Lyndon advises, one of 63 such horsemen aboard on a voyage which left Liverpool on Mar. 3, 1915 and landed at Boston on Mar. 14, 1915 - with just 18 regular passengers & the 63 horsemen. Is it possible that Devonian was used, in part at least, as a horse transporter during WW1? It would seem that is most likely so, since the 'The Sphere' article on site page 69 indicates that the vessel was designed to accommodate animals. 'The upper deck is arranged to convey 850 head of cattle, also accommodation for horses, sufficient drinking water being carried for them in the double bottom.' The voyage that Lyndon refers to and the final voyage in 1917 were both westbound & surely were both simply returning personnel to Boston. But returning on the vessel that took you to Europe in the first place (with horses) would make much sense. One of the 63 horsemen indicated upon arrival in the U.S. that he had departed from New Orleans as a 'horse attendant' in Feb. 1915. Could it be that Devonian had sailed from New Orleans for Europe with a cargo of horses? Or possibly that that person originally sailed on another ship & just returned on the Devonian? Most likely a Leyland Lines ship did sail from New Orleans because per the Whitaker's Almanac 1902 data low on page 69, Leyland Lines sailed regularly to New Orleans. If it is possible that YOU can throw some light on the matter, your help would be appreciated. 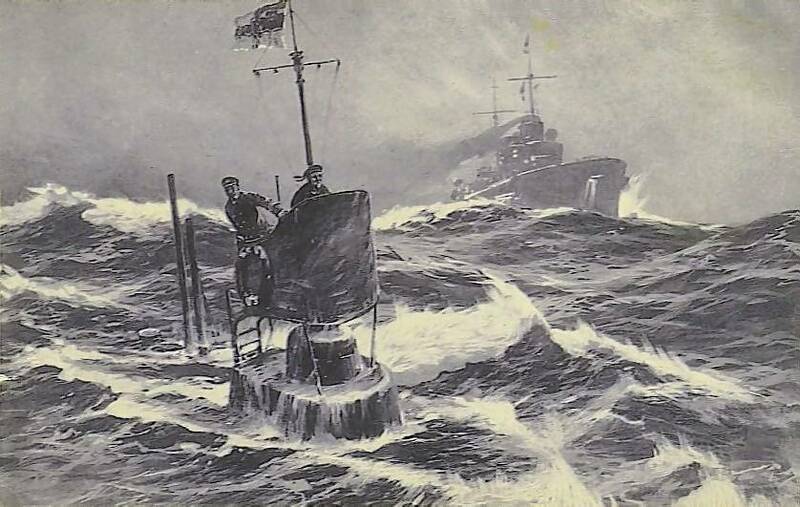 The image which follows in no way relates to the Devonian sinking, but it probably gives the flavour of what part of a U-boat action might have looked like. The postcard image is by German artist Willy Stower (1864-1931) though I cannot spot his signature which would, I believe, normally be at bottom right. It dates from early in WW1. Very little is known, I have read, about the artist. Perhaps at some time in the future, I will feature somewhere in these pages a most dramatic submarine recruiting poster that he painted. 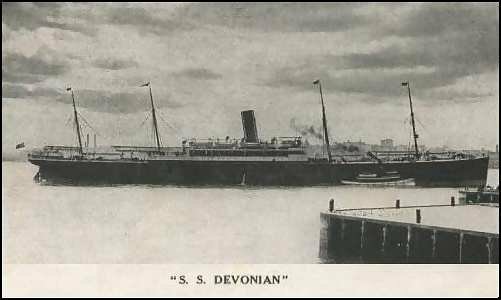 There have been many Devonian's - This, the Hanoverian then Mayflower then Cretic then Devonian (in 1923) (launched in 1902) is one of the other Devonians. And there is an image of the same vessel here. And here is a composite image with two of the most precious possessions of the family of Thomas Burdett Knight, 1st officer on the Devonian at the time of the Volturno tragedy. At left is what is believed to be a group of Volturno survivors at Liverpool in 1913 with 1st officer Knight at your extreme right. He seems to be holding a bellows camera. Also presented is an image of Volturno survivors scrambling to get aboard Devonian after rescue in mid-Atlantic. Both come from Jon Lawton, of Gloucestershire, U.K., & via Gordon White of Bolton, Lancashire. Jon & Gordon are cousins and Thomas B. Knight was grandfather to them both, I understand. We thank you both. And, also courtesy of Jon Lawton, are a couple of images believed to be of the Devonian crew. We are unable, alas, to identify with certainty the individuals in the images, except for 1st Officer Thomas Knight who is the officer at left in the right of the two images. But there is a very good possibility that the young crewman with the distinctive woolly hat - in both images - is William Brown. Lots more detail about William is available on page 66. Maybe, just maybe, other descendents of Devonian crew members will see these images, & permit the identification of some, at least, of the others. This page will, hopefully, continue to track data about the Devonian as it comes to hand. On page 43 I indicated that Board of Trade Gallantry Medals or "Board of Trade Medals for Gallantry in Saving Life at Sea" were issued to many crew members of the rescue fleet. Bernard de Neumann, of The City University in London, England, has an extensive study upon recipients of that medal and his section re Volturno, available here lists the following as Devonian recipients, all of whom received the silver medal, the highest medal, of the two SGM (Sea Gallantry Medals) medals available, the other medal being a bronze. T. STEELE, chief mate, T. B. KNIGHT, 1st mate, W. H. BAKER, 2nd mate, J. SOUTER, 5th engineer, J. NAVARRO, bo'sun, F. J. BAILEY, bo'sun's mate, W. H. FLETCHER, J. BROWN, J. ROSSITER, L. O'NEILL, QMs, W. WALSH, lamp-trimmer, A. HAZLEWOOD, W. A. REED, E. D. CUNNINGHAM, W. BROWN, W. POTTER, C. WOODS, ABs, J. H. PRICE, OS. Now on Jan Daamen's site there is a list of the crew of the Devonian provided by Tony Jones of North Wales. There are a couple of anomalies in the two lists. I believe Tony's list is just of the Devonian crew members who received medals. All named in the list that follows received Sea Gallantry Medals, excluding only the Captain - Alfred W. V. Trant. Tony Jones advised me a while back that awards were generally not given to the fleet Captains, who were considered to be just 'doing their duty' and had no actual personal involvement in the physical rescue efforts. Here, with his kind permission, is Tony's list which has full name detail rather than just the initials. Thank you, Tony! 1) The Marine Medal of the 'Liverpool Shipwreck and Humane Society' - 1a = gold, 1b = silver, 1c = bronze. With certificates in each case and for Steele, Knight and Baker, silver mounted barometers. 2) The Medal of 'The Life Saving Benevolent Association of New York' - 2a = gold, 2b = silver, 2c = gold medal pin and $25 in gold, 2d = bronze medal pin and $25 in gold, 2e = bronze medal pin and $20 in gold, 2f = bronze medal pin and $20 in gold, 2g = bronze medal pin and $15 in gold, and 2h = bronze medal pin and $10 in gold. 3) Leyland Line itself would seem to have recognised the efforts of the Devonian's crew by making special presentations, amongst others, as follows - 3a = solid silver centre piece, 3b = solid silver tea service, 3c = gold hunter watch. 4) Lloyd's Bronze Medal for Saving Life (at Sea). I am advised that the 'Liverpool Shipwreck and Humane Society' medal awarded to Chief Officer Thomas Steele, in a good very fine condition, but with minor edge bruising, was sold at a Dec. 9, 1999 auction by 'Dix Noonan Webb' of London. The hammer price was �210, I learn. One of the anomalies I refer to is the seaman named Price, who appears as J. H. Price in one of the above lists & William J. Price in the other. He is now of some interest to the webmaster as a result of reading the words of David Zeni in 'Forgotten Empress', his book on the sinking of the Empress of Ireland, which sank in the Gulf of St. Lawrence on May 29, 1914, (in just 14 minutes no less), after a collision with the Norwegian registered collier Storstad. In that book David talks of Ordinary Seaman J. H. Price, from Liverpool, a seaman on the Empress of Ireland. Upon his arrival in England, Price was scheduled, I read, to receive the Albert Medal for heroism - for his part in the Volturno disaster. David states that Price, a crew member on Devonian, saved two passengers from the burning hull of the Volturno & that his rescue boat capsized alongside Devonian just after off-loading the rescued passengers. Seaman Price did survive the Empress of Ireland sinking & as David neatly says it, 'In a period of less than eight months, Price had been both hero and victim of disaster at sea'. All most interesting! David Zeni, I thank you. The first Volturno reference I have seen to the Albert Medal. The Empress of Ireland is not the subject of this web site. But I was interested to see that a copy of the report of the Commission of Enquiry into the Empress of Ireland sinking, printed by the Parliament of Canada in 1914, was for sale on e-Bay in Nov. 2005. The high bid as this page was updated was U.S. $485.00. The vendor indicated that he has collected Empress of Ireland materials for 15 years & had only seen this report twice in those years & the for sale item was his second copy. Now I try in this website to make it 100% accurate, down to the very last detail. And I correct it frequently as errors large or small come to my attention. So, having read the source stated above, I have tried to check to ensure that Seaman Price did in fact receive an Albert Medal. I innocently thought that would be easy to check. But not so! I am advised, however, by my English authority on the subject, that what is generally known as the 'Albert Medal' is more properly the 'Albert Medal for Saving Life at Sea', or (because there is a land version also), the 'Albert Medal for Saving Life on Land', depending upon the circumstances. And that Seaman Price did not receive, in fact, either of those awards. Nor did he receive the 'Albert Medal (Royal Society of Arts)' (a recipient list was available via this page, but no longer. Maybe elsewhere on that site today) which is a whole different medal & a whole different subject. My authority believes that the 'Albert Medal' got confused with the 'Sea Gallantry Medal' which Seaman Price did indeed receive in the silver version. Having started this discussion about Seaman Price, I should add some words, written later but not with the intent of being critical of anyone. It would seem, however, that once one fact is written somewhere, someone later reads those words & accepts them as being factual perhaps without reservation. It is easy to do. I cannot personally check all the historical records, so I am quite sure that these pages also contain similar errors of commission. Such may have happened re Seaman Price. I have now read some words in 'Fourteen Minutes', the story of the sinking of the Empress of Ireland written by James Croall (1928- ) & published in 1978 about 20 years before David Zeni's 1998 volume. I suspect that James Croall must have read something in his research that lead him to believe that Ordinary Seaman J. H. Pryce (as James Croall referred to him) received the Albert Medal. And David may have sourced his data from Croall. Where did James Croall get his data? I do not know. Mr. Croall listed a vast number of contemporary sources in his volume & any one of them may have contained data about Seaman Price/Pryce. But his story, per James Croall, seems to be identical to that referenced by David Zeni although David surely adds more words that relate to Devonian. But I must say that I am still puzzled. On this site already are extensive reports - here & here on page 43, that state exactly what the Devonian did that fateful day in 1913, & those reports even list all the crew members of each lifeboat that was sent. And there are further words from Captain Trant lower on this page. Nowhere in the crew member lists is Price mentioned. But there IS a reference in one of the above reports to seaman Price. 'October 10th, at 0:30 a.m., an empty boat was seen on the starboard side, and immediately afterwards a man was heard crying out in the water. With great difficulty he was got on board, ordinary seaman J. H. Price showing great pluck in going down the ladder into the water and putting a rope around the man, who was in an unconscious condition. The doctor revived him and he was found to be a passenger from the burning ship.' And there is a reference to that matter in Trant's words below with no mention of the seaman involved. It would seem however from all the text I have been able so far to read & particularly the reference to a ladder, that Price must have been aboard Devonian when he rescued that passenger from the sea. There was indeed a Devonian lifeboat (#3) that was destroyed upon its return, but Price is not listed as being among its crew. And indeed could not have been aboard that lifeboat which was at sea attempting passenger rescue at the time indicated when Price descended the ladder. Price was awarded the Sea Gallantry Medal. But exactly what he did re the second Volturno passenger he is said to have saved, eludes me in these circumstances. At this point I think that there was no second Volturno passenger he rescued. Devonian lifeboat No. 3 did rescue a single Volturno passenger in its trip (same London Times source) a matter which seems unrelated to Seaman Price. As follows -Captain Trant speaking - 'His boat afterwards returned with one man who had lowered himself over the side of the Volturno and had been picked out of the water. While the crew were being taken back on board the boat was capsized, but the crew were hauled on board ; the boat was lost.' Can anybody add anything? Here is the text that appeared in the 'Liverpool Echo' of Tuesday, Oct. 14, 1913 (thanks Ray Brown). I have tried to get it on page exactly as it was published. A few words however do read strangely. HOW RESCUE WORK WAS CARRIED OUT. AWFUL SCENES ABOARD BURNING LINER. The Leyland line steamer Devonian arrived at the Landing-stage at a quarter to one today with fifty-nine survivors of the Volturno on board. A large crowd witnessed her arrival, their interest being enhanced by the sight of a number of the emigrants on the deck of the vessel as she came alongside. Captain Trant provided a thrilling account of the rescue work accomplished by the Devonian. When he received the message from the Carmania reporting the disaster the Devonian was about 130 miles away, and orders were sent to the chief engineer to make all speed possible. They drew alongside the Volturno shortly after ten o'clock in the evening of October 9, and found her blazing fiercely from forward to abaft the bridge. Pitiful cries for help came from the people on board. They lowered and sent away No. 3 starboard lifeboat, and then steamed round to windward of the vessel to pick up the boat. Shortly after midnight a boat was seen on the starboard side, and immediately afterwards a man was heard to cry out in the water. With great difficulty he was taken on board in an unconscious condition, but he soon recovered. He had swum from the burning ship. No 3 lifeboat returned at 1 a.m., unable to approach the burning vessel on account of the heavy seas and the rolling of the ship. They had picked up one man who had jumped overboard. 2 a.m. - Attempted to hoist No. 3 boat in order to steam round to leeward to launch her again. She was stove in on the ship's side, and broke adrift. Got crew on board safely. There was a fresh breeze, and heavy seas were still running. 3 a.m. - Steamed round and lay close under Volturno's stern to be at hand in case the vessel foundered, and to be handy to get the boat away at dawn. Again heard pitiful cries and shrieks from the burning vessel. The fire seemed to be creeping out, the forward end being nearly gutted. 6.5. - Lowered No. 5 lifeboat and sent her away in charge of second mate W. H. Baker with crew consisting of F. Bailey (boatswain's mate), W. Fletcher, and I. O'Neill (quarter master), W. Potter, W. Reid, E. Cunningham, W. Brown, and Arthur Hayward (able seamen). She launched and got right alongside the burning vessel, being the first boat of any ship to do so. She received some damage, two planks stove in, but she kept tight and commenced taking in women and children. I instructed the officer to see that they came off first. He reported later on that the captain and officers did good work in controlling the male passengers who wished to rush the boat. Steamed ship round to be handy to pick up boat; noticed other steamers making towards the vessel and getting their boats away. 6.30. - Boat returned with women and children. Got them on board by means of coal baskets without mishap. 6.40. - Boat left again for Volturno and took in more women and children. Steamed round to position to pick up boat again. Noticed other ships' boats were getting away with people from the ship. 7.24. - Picked up boat again and took from her more women and children. Baskets worked very well. 7.40. - Boat again left for burning vessel. By this time all women and children had been taken off by the nine other assisting passengers, the remaining survivors having been taken off by the nine other assisting steamers. 8.45. - Devonian proceeded on voyage. When passing Volturno fire appeared to be getting more aft. Smoke was issuing from the whole of the 'midship' house and and boat deck - and flames were showing on the main deck well aft through the seams. I am glad to report on the steady behaviour on the part of the whole crew during these experiences, and more especially is praise due to the officers and men who volunteered to undertake the work in the boats. The captain mentioned that, apart from the vessels which came to the aid of the Volturno, the Leyland steamer Asian stood by handy in case her services were required. "Second Officer W. H. Baker," added the captain, "made a special report to me of the plucky conduct of Arthur Hazelwood, one of the able seamen in No. 5 boat. When she was taking in the women and children a frenzied woman on board the Volturno, with the intention of having her child caught by those in the boat, threw it down but it fell between the ship and the boat. "Hazelwood at once jumped into the water, and came to the surface with the child in his arms. He ran great risk of being crushed between the ship's side and the boat. He and the child were with difficulty dragged into the boat." A GIRL PASSENGER'S SAD PLIGHT. One of the most pathetic sights in the crowd of weeping passengers on the Devonian, was that of a little girl about five years of age. She was warmly and even daintily clad, and looked, notwithstanding her isolated condition, a picture of brightness and health. She was absolutely alone in the world. There was no one, on the ship, who could converse with her in her native tongue, and none of the interpreters who boarded the Devonian at the Landing-stage could speak her strange language or dialect. The only intelligible word she can utter is "Daddy". She was greatly attached to the stewardess who had charge of her, but could give to no one an account of herself, her parents, or destination in the United States. The only means of identification appeared to be left to the resources of photography, and to a Roman Catholic medal, suspended from her neck. Webmaster's Note. A photograph appeared in the newspaper but is so dark in the microfilm copy from which the page is taken, that it cannot be reproduced here. The caption said "The unknown German girl brought by the Devonian, whose story is told on this page." But do now see here. OFFICERS FIGHT TO KEEP MEN BACK. Second officer Baker, who was in charge of the first boat to rescue passengers from the Volturno, related a graphic story to a representative of the "Echo". "Early on the morning following our arrival on the scene of the disaster," said Second officer Baker, I determined to make an attempt to reach the burning vessel. 'Neck or nothing, let us go,' I said to the men, and a crew of eight men agreed to put out on a boisterous sea, and amidst obviously perilous conditions. "When we were near to the vessel we could see that there would be a rush to escape. We called out to those in charge to keep back the men, who were pressing forwards, and to let us the women and the children first. " Four officers then used their fists to drive the men back, and some of them went down like ninepins. For a time the women were afraid to jump. They were terrified. Children were then thrown in by their parents. Later on the women began to drop into the boat from a height of twenty or thirty feet, but the distance varied from the fact that a heavy sea was running and the lifeboat rocked constantly. Baker and his heroic crew made two journeys in all, and they were able to save forty-one women and children, together with the father of five of the children. This man, Mr. Baker explained, had helped to get his wife and family into the boat and when they had disappeared down the side, he went back to the rest of the men on the deck. "My man, my man!" shouted the woman, pathetically. "Is that your husband?" asked the officer. "I had seen what he had done, and it was because he deserved a reward for his splendid conduct, first in helping the people in, and then stepping back, apparently to meet his fate, that I insisted he alone of the men should come off then." When Baker's example was seen there was an immediate attempt on the part of the other liners to send their boats, and at one time there was a flotilla of these alongside the Volturno. The work was carried on with the most considerable danger. "Sparks were flying, the heat of the sides of the vessel was intense and the smoke was blinding." From time to time, some relict of the fire, such as a disjointed derrick or a piece of the funnel, would tumble into the water, and might easily have injured rescuers and rescued alike. Some of the children actually did alight on their head, and one little one, whose legs struck the bulwarks was saved by the gallantry of one of the sailors. "On the Volturno," added Chief-officer Baker, "we could see the smoke coming up between the beams of the deck, and the men were almost standing in the flames. "During the night, the scene was horrible. Shrieking was continuous, and several of the women held up their babies and outlined them in the glare, and begged of us to come and rescue them." The liner La Touraine arrived at Havre today. The most painful reminder of the disaster was a party of little orphans crouching in a corner dressed in clothes given by the passengers of La Touraine, who did their best during the run to Havre to interest them and make them forget their terrible experiences. The little ones, however, refused to be comforted, and plaintively called for "Papa" and "Mama". Well done! All the directors, the manager, and the staff of the Leyland Line are proud of you. The other four pages related to the Devonian are here: 66, 67, 68 & 69.